It is the time of year again when we start thinking about next year… The plans, programs, and activities that will allow us to meet and exceed our 2016 goals. How easy or hard are your sales goals for next year? How well did you meet this year’s goals? Do you need to be super aggressive? Or can you relax a bit? Break your sales goals down by quarter and month. Then, concretize goals by converting them to understandable quantities. Try to get 3 more dessert orders per shift. So, once you figure out what sales goals need to be met, you can then plan to add non-sales specific initiatives in the “easier” months. Conversely, you’ll want to plan marketing initiatives when it seems making goals will be a challenge. Beyond sales goals, what about your performance with Customer Service scores? Local Review Sites? Number of hours of community service or donation amounts? How is your customer database of newsletter subscribers? What goals do you have for Customer Experience or the Brand for this upcoming year? Are you continuing existing initiatives? Need to start new ones? Keep all these goals in mind. They may drive a key focus, messaging themes, promotions, and need to be incorporated into your planning calendar. A business focus or theme represents overarching sentiment, messaging, program or experience for a time period. It may center on a customer facing initiative such as customer experience, new products or services. Or it may be internal focused supporting competitive issues, strategic weaknesses, etc. “5 Star Success!” – Service goal to get locations to score 5-stars on their secret shopper reports. “Light Bright” – Competitive goal to increase sales during your slower evening daypart. Typically your sales goals and business theme will drive your seasonal objectives and news. Sometimes you’ll use your seasonal goals to determine the focus. Use your Goals from above and split them appropriately through the year. Break them down by season, quarter, or promotional period. For example, at Starbucks the Christmas holiday season was a very intense sales period that lasted from mid-November to just after the New Year. There were sales and service goals set solely this 7 or 8 week period. Pushing heavily, Starbucks Gift Cards! This promotional period had the highest number of featured and new products, and the shortest number of weeks. But, we knew a great Christmas season would roll into a great new year! All these new, limited time items create news for customers. In fact, during the Holiday season Starbucks turns their white cup with green logo red. Some customers start to salivate just seeing the red cup. For them Christmastime starts when Santa is in view during the Macy’s Parade and the red cups arrive at Starbucks. Fun fact: January thru March – the First Fiscal Quarter of the year and typically slower time for restaurant and retailers is Starbucks second fiscal quarter. Starbucks decided Q1 takes place from October thru December – a busy time of the year. This ensures Starbucks starts off the year strong with a great Q1. Clever, huh?! If you don’t have news, you may need to create it. This is where – during the Sales Goal portion of your planning – having an honest understanding of how hard or easy it is to make your goals is important. If you haven’t already, you need to determine the investment needed for funding the programming to meet or exceed your goals and objectives. This may range from training, to advertising / marketing budget, product or service development, and more. There are two ways to look at this funding…as an expense or an investment. We always feel money spent to improve the experience for customers is an investment that delivers return. I’ve always thought of a promotional theme as the bow that ties together all the programming and activity in a way that is relevant and meaningful to the customer. This is where we build the communication and marketing programs to communicate the themes and news to our customers. Since you know what you’ll be featuring, what your “news” will be – what will be the theme to tell the story? If you aren’t a single-location organization, you’ll want to consider how you’ll split the sales responsibilities among your leaders, departments, and locations. And you’ll want those teams to break goals into those concrete, understandable measures. Yes, we know we’ve simplified the steps, but hopefully this will serve as a nice guide for you and your team in prepping for an amazing 2016. Differentiation has become one of those marketing buzz words we hear too often. So frequently, the term seems to have lost its meaning. Nevertheless, it is a fundamental concept. I prefer the term “remarkability.” Doing the things that cause people to make remarks about you – literally being remarkable. Let’s take a look at why being remarkable is so important and why it pays to be different. So here you are… offering your product. Doing what you do well and providing customers what they want. Sales are high. Everyone is happy. You own the market for your product or service. We’ll give that a happy check-mark. Next, we have a situation where you provide customers Product A, and your competition is providing Product B. For example, you offer Italian food, your competition offers French cuisine. Sure, you’re both in the restaurant business, but catering to different taste preferences. So, you both do well. What is interesting about this situation is that we have been experiencing a trend where – instead of being happy with specialization – brands are expanding offerings to try to take business away from the competition. Olive Garden hops on the burger trend with an Italiano Burger. Dairy Queen serves a quesadilla. Subway offers “Flatizza” pizza. And, Taco Bell – not wanting to miss out on the morning daypart – offers breakfast including a waffle sausage taco. I understand the concept of increasing sales by expanding offerings to appeal to a broader audience. But, if customers aren’t going to come to you for your specialty, they probably won’t be attracted by something that isn’t your core competency. Copying your competition is the opposite of trying to be different and remarkable. These are bandwagon offerings – making you fit in, be more similar. Few of us are running a business where we are the only provider of a particular product or service. We are offering things that are popular, and we’ve got competition. Now we’re in a situation where the customer has a choice in getting what they want from more than one provider who does it well. Customers have a choice between you and your competition. The result will be a reduction of your sales. Hmmm? What to do? This requires a question mark in our diagram. 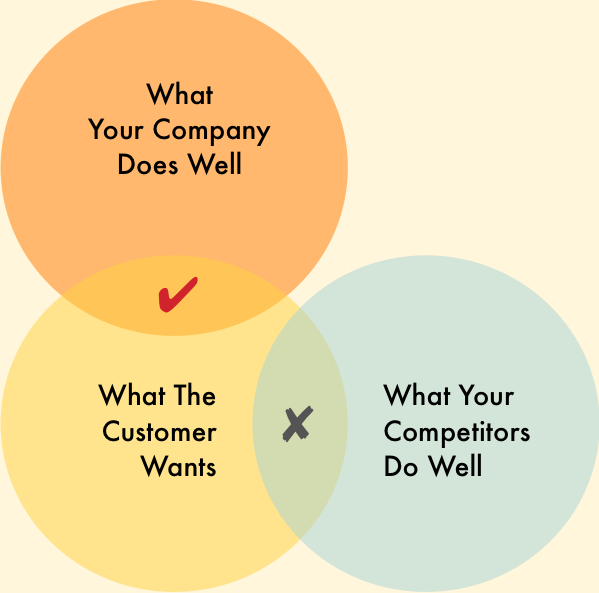 The best way to attract customers and prevent them from going to your competition is by offering, being, or doing something different… To be remarkable and provide value in a way that your competitor isn’t and can’t. Let’s say you’re in the restaurant business. We recommend you find a way to be the –EST in what you do, not the –ER. Here’s an example. They’ve got a menu that’s tasty. They’ve got service that’s friendly. faster, tastier and friendlier than your competition. However, if you’re going to make the effort, instead of simply trying to complete what they do, you should beat what they do. Being the –EST gets you noticed and differentiates you, from your competition, in the mind of your customer. We’ll put a star in that spot! By being different, by being remarkable, you can differentiate yourself from the competition. You are no longer offering the same thing, and customers will be able to notice the difference. So, being different truly does pay! Oh, by the way… this article was first posted as an article in our free Sand For Your Inbox newsletter. Maybe you want to subscribe and get articles like this sent directly to your inbox? No matter what you call them… your customers, clients, consumers or participants – they are all Guests when they visit your location. Being a great host to those visiting your location is no different from entertaining friends and neighbors at your house. While we do think about details when planning a big event at home, as restaurant and retail owners, we and our teams need to be a great host to Guests every day. Here is our guide to being a great host to Guests – from preparation and during to after your event. You’ve got to prepare and plan if you want to make a great impression. You can’t just wing it and hope it comes together. At home you’d use PaperlessPost, Evite or good, old-fashioned printed invitations. At your location, if you are hosting a special event (a sale, grand opening, seminar, etc), you’ll use postcards, social media, and good, old-fashioned printed invitations. Plan for how many people you want and expect to attend. Plan to have enough: food, drink, entertainment, supplies, and helpers to make the experience just as pleasant and fresh for the first to arrive and the last to arrive. Additionally, at your location part of your preparation is making sure you have enough staff, that they get time to take breaks and lunch – so they can stay fresh and “on” for your guests. This sounds quite basic… But, if you want Guests to show up, you’ve got to let them know it’s taking place. Give enough advance notice so your Guests can work the event into their calendar. Sounds basic… but… put your best food forward. A great chance to do a “spring cleaning” – making your place spick-and-span. At home you make sure at least the rooms your party guests will be in are clean. The main room, kitchen, living room and bathrooms. You vacuum, dust, wash windows… making sure your place is comfortable and leaves a great impression. At your location – it should be the same thing. Each day should be prep-cleaned. Why does dust build up on your light fixtures, merchandise shelves, and massive dust bunnies on the floor? You wouldn’t let that happen at home. At home, in addition to cleaning, you may want to make sure you’ve spruced up the place with decor. Put out a few vases of fresh flowers, light candles. Finally hang those pictures, get the carpet cleaned. Too at your location, be sure you’re keeping your decor looking fresh. Maybe change out the drab silk plants. Take down a few of the notes and stickies that are collecting at the POS area. What does your place smell like when people first walk in? Is it pleasant and welcoming? At home the smell of appetizers and cookies baking may be all you need. But, your cleaning helps to rid your place of any stale smells. At your retail shop and especially at your restaurant, the smell of cleaning supplies and bleach is not a good smell. We want to see you keep it clean, not smell it! Get an outsider to tell you how your place smells. We spend so much time in our locations we no longer can pick up if there are any unpleasant odors. What sounds do you hear? Is there music that fits your event? Do you bring in live entertainment? Are there sounds guests shouldn’t hear? Employees gossiping to each other? Loud kitchen noises? Greet Guests – Make sure someone is there to greet and welcome your guests as they first walk in. Make a nice first impression. This is the same at home or at your business location. A smiling, cordial, warm greeter is a perfect way to introduce Guests, and especially new Guests to your location. At home, you would introduce your guests to your spouse and family. And introduce one Guest to another. You’ll let them know where the bathroom is, where they can get a drink and where the snacks are. At your location…while maybe you’re not having customers meet each other, it makes sense to ensure they know who on your team is there to assist them – make their experience better.At your location, you don’t want customers to be strangers to your offerings – your products, services – and the layout of your location. Here are the changing rooms. Here is the bar. The toilets. The coat check. Here is how you order. Here is how you pay. Re-Stock & Refresh – As people dig into your offerings, the display is going to be depleted and messed up – whether a bowl of buffalo wings, a shelf of shirts, or wall of widgets. Plan to refresh with extra supplies, straighten up what gets messy, and take away what’s finished. Join The Fun – Make sure you mingle with your Guests. Take this opportunity to get to know who is attending and get to know more about them. Look For Cues – Watch your guests for non-verbal cues that they may need help. Make sure they don’t look too warm, too shy to ask for help, that their glass isn’t empty. As People Depart – As they depart, thank them for coming! Ensure they know the event was even more special because they were there. Send them home with a party favor. Perhaps even an offer to return again soon!? Send Thank You Notes – While the Guest is typically supposed to send a “thank you” note, as a business – why not send thank you notes to your Guests? Let them know you appreciated their visit. We hope this guide helps you and your team be the best host to all your Guests. We all want our customers to return to us. In a moment of choice, we hope they would choose us again over a competitor. That they’ll be loyal to us. Google will provide you with thousands of ideas for both reward and loyalty programs. You’ll find the terms Reward and Loyalty used interchangeably. This creates confusion as rewards don’t drive loyalty. And, if we’re calling our reward program a “loyalty” program thinking we’re building loyalty – we’re doing the wrong things. Rewards are typically based on games, points, and providing incentives to drive customers to meet purchase thresholds. If customers behave like we want – visit more frequently, increase average ticket – we’ll reward them. Loyalty, done properly, involves understanding our customers by collecting information and using that information to personalize their experience. Loyalty is perceived as expensive and not easy to track, so we settle for rewards. Let’s look at the Starbucks Card. At its core, it is simply a form of currency. You give Starbucks money in advance, and they hold it for you until you swipe your card to spend it. After you register your Starbucks card, you earn “stars” for each transaction. Earn enough stars and you earn discounts and free drinks and food. This is a digital punch-card program. It rewards heavy users and creates a bit of status for regulars. You feel appreciated for giving your business to Starbucks. The star system encourages frequency and a bit of urgency – like airline miles – if you don’t earn enough you lose your status and rewards drop. Buy 12 get one free. They do give you treats on your birthday – which is nice! Loyalty is defined as faithfulness or a devotion to a person, country, group, or cause. A strong feeling of support or allegiance. We all want this from our customers, but are we offering it to them? Are we faithful to them? Devoted? Do we support them and pledge our allegiance? The secret to shift from rewarding customers to making them loyal is… to be loyal to your customers first. A good friend is loyal. They remember your birthday. They know your favorite color, your ring size, your shirt size. They buy you great Christmas presents that are a perfect fit for you – because they know you. The Starbucks Card could be easily turned into a Loyalty Card if Starbucks used data to better understand customer likes and preferences at Starbucks. For example, let’s say you typically buy a mocha or caramel flavored latte at Starbucks. Starbucks would know this from your purchase habits. The holiday season arrives and they send a personalized message to you announcing the Gingerbread Latte is coming soon! Or perhaps they provide you a cardholder-only taste preview of the new flavors Cherry Jubilee Mocha or Chestnut Praline Latte based on your preferences, not just what their promotion is. Starbucks sees you purchased a Verismo brewer this past summer. Knowing this, they could email and offer for a trial pack of the holiday blend pods. Starbucks benefits in creating a sampling opportunity of these coffee flavors, and may drive an incremental visit. But, the real reward is being highly relevant to customers. Like that loyal friend, they would understand customers enough to know what they like and prefer. Ritz-Carlton hotel staff take notes about guests preferences – likes and dislikes – from choice of wine to how many pillows preferred, and they tailor the guest experience accordingly. Starwood’s W Hotels have systems to document customer preferences. For example, if a guest expresses a love for a certain sports team, the Welcome Desk staff from property to property will provide a game schedule and list of local channels so the guest may watch the games. So far I’ve only mentioned expensive computer-based tools. But, you could launch a system tomorrow for the price of a stack of index cards and file box. A coffee shop I used to frequent in Jacksonville, Florida would store customer buy-5-get-one-free punch cards in a 3″ x 5″ index card file box. They would also make notes about customers on 3″ x 5″ cards. While this manual system sounds archaic… it was cheap, quick, and allowed any employee to access information in moments. Organized by first name, they also learned our names much faster, making it a more personal experience. If you want to drive long term loyalty from your customers, consider the programs you now have in place, and what needs to be added to first be loyal to them! More than simply rewarding frequency or ticket, whether you use high- or low-tech tools, loyalty comes from understanding and being loyal to your customers. We want great experiences from those with whom we do business. Our customers want the same from us. However, sometimes our focus on “going the extra mile” for our customers causes us to neglect the basics. For example, Starbucks Coffee has gone the “extra mile” by offering a smartphone app that allows customers to digitally order and pay for products. A neat idea, but the app offers little value if Starbucks doesn’t continue to deliver the basics of friendly service and fresh, hot coffee. We suggest, forget going the extra mile — just go two or three extra steps. Just a few extra steps are enough to delight your customers. Let me elaborate. Here is a recent example of a restaurant going just 2 or 3 steps with the most basic products – water and bread. Recently, at the Clifton Inn Restaurant in Charlottesville, Virginia, when the waiter brought water to the table, he asked if we also wanted lemon or lime. So simple to offer and +1 step further than many restaurants. A choice of lemon and lime was nice, too. Their lemons and limes weren’t rough-cut wedges, they were thin and even slices. Almost “classy,” if that’s a way to describe cut citrus. That’s +1 more step than those who serve wedges. But, the Inn went +3 steps. Instead of draping wedges over the lip of our glass or delivering them to our table in a small bowl; they presented the lemon and lime slices, neatly shingled, in two even rows, on a long white plate. Using tongs, the waiter added a slice or two to our glass. That’s the +3 step. The Clifton Inn serves bread and butter with dinner. As do 60% other restaurants. Big deal, right? Well… Clifton’s bread was hot from the oven. That’s a huge +1 step. How many times have you been served hard or stale bread at a restaurant? I get the strong (and gross) feeling, at many restaurants, a bread basket makes its way around from table to table until someone finally eats it. The butter at Clifton? It was soft. That’s another big +1. How many times have you been served chunks of rock-hard butter that tears apart your bread when you try to spread it? How difficult is it to serve spreadable butter? Once again, however, the Clifton went beyond butter that spreads to a major +3 step. They whip their own butter in-house. Not hard to do, but above and beyond for sure. The Clifton delighted us before our appetizers even arrived. The rest of the meal, right through dessert, was delicious! And, while the service was awesome, none of this had to do with their service. They pay attention to details and set standards of 3 extra steps that went beyond the normal to delight us. Bread and water. How sad is it that serving warm or hot bread and soft butter is “out of the ordinary?” These were basic basics. So “out of the ordinary” that I’ve been telling people about it. I’m telling you now in an article. Who thought bread and water would be worth remarking about? Restaurants have removed steps and stopped paying attention. They’ve decided it is cheaper to slice bread and keep passing it around it until it is gone. And, easier to pre-portion butter in mass and store it in a fridge. The Clifton Inn isn’t spending thousands of dollars, or investing in high technology, or even going “the extra mile.” They went a few extra basic steps – thinking about the customer experience. A few basic steps beyond minimum. What two (or three) extra steps could you add to your business? At the point of sale, Nordstrom employees walk from around the cash register and hand you your bag of purchases. any retailers wrap your clothing purchase in branded tissue and seal with a logo sticker. Instead of chucked into a bag, they treat their products / your purchase with care. In Amsterdam, nearly every retailer asks if your purchase is a gift and, if so, offers free wrapping. (They even remove the price sticker). Two different restaurants I’ve been to, one offered a single pot of their special blend ground coffee to brew at home. Another provided a single-portion of their famous scone mix for baking at home. Provide premium, brand name shampoos and lotions. Don’t charge you to drink the bottle of water they leave in-room. Offer an umbrella to borrow if it rains while you’re visiting town. Kimpton’s Hotel Monaco provides a gold fish for your room to keep you company if you’re traveling alone. When I order pocket notebooks from Field Notes Brand they include an old-school clicky pen and rubber band. At your company, start with the simple things… At the point of sale. In the way you print your menu. The way you answer the phone. In your “Please Wait to Be Seated” sign. In the music that plays at your location. Your take-out or delivery orders. Next time you’re thinking you’ve got to go the extra mile to please your customers, realize you may not have to go that far. Just take the first two or three steps. That alone may be enough to delight them. This article has been sent directly to Sand for Your Inbox members. Become a member today for free, and get sand in your inbox! Do you know how well your business compares to your competition? More specifically, when it comes to how well you deliver Customer Service and Product & Service Offerings; how comparatively innovative you are? Also, beyond your competition, how do you compare with others in your industry? Or, how well do you compare in these categories to any business? I know… these are big questions. If you do know these things, how do you know? First-hand knowledge? Or, are you relying on a hunch? What you’ve heard? Assumptions? In this scoop of “Sand for Your Inbox,” we provide the ideas and tools to help your team gain that first-hand knowledge! The best way to know the answers to any of these questions is to visit and experience for yourself. Be a secret shopper of your competition, and of your industry. We recommend not only touring your direct competition, but also those who compete in the same category. For example, if you are a bookstore, your competition naturally includes other bookstores in your area. But, you also compete with any retailer who sells books. Don’t just compare your pizza place to other pizza places… Your competition includes all dining-out options. Go beyond product offering to see how you compare with any other business customer service, in-store policies, signage, speed of service, consumer promotions, etc. Determine what topics/categories you want to explore. Service? Pricing? Product Offerings? Merchandising? In-Store Experience? Create a list of locations that excel in a category. Plot – on a map – a logical path for visiting these locations. Use our suggestions (below) to create your own questions “What To Look For” when you conduct the visits. Depending on group size, assign topics and visit locations / take notes. Teams return to your meeting point and spend time discussing findings. Prepare 5 to 10-minute presentation to share back to the entire group. Regroup post-tour and discuss finding. When visiting, be respectful of the operators. We don’t recommend going in large groups – it becomes too obvious you’re “shopping” their locations. Be careful if you plan to take photos – many businesses get upset when people start using cameras in-store. Make your notes outside and away from the location. Think of how you’d feel if someone was in your location with a clipboard and pen writing things down. If you can afford it – expand the search to a region where you live… or anywhere in the country. Or, if you don’t want to limit your research and have the budget open up the world for this type of benchmarking. Here are some starter questions and things to look for. Is the entry area clean and inviting? What do you notice even before you enter? Does the store feel welcoming? Does someone greet you as you enter? Does it feel sincere? Welcoming? What is the overall feel of the location? Is it a place you would feel comfortable to linger – shop leisurely? Or do you get the feeling you’re being whisked through? Do the products look high quality? If possible, buy and try – especially if it is food or drink related. From what you tried, was it as good as you hoped it would be? How is the product – food, clothing, etc. presented? Does it look fresh? What do they use to indicate everyday offerings? Are their menus slick printed, or handwritten? Does the menu match the brand? Are there specials? Limited time offerings? If so, how did they let you know? What is the experiencing as you are served and pay for your product? Was the person on the register friendly, nice, courteous? Is the POS area clean or cluttered? Can you tell if they use Twitter, Facebook, etc.? If so, how do you know? Check their social media sites? How many likes and followers? Would you bring a friend from out of town to this concept? Was visiting this location a memorable experience? We’ve attached a Store Tour guide we created and used with a client in Washington DC. It features specific locations in the Georgetown area. The “best” practices you collect allow you to catch up with the competition is doing. This is the “bar” your customers are using as rate good versus bad. When you catch up to the competition, you should create “next” practices. Next practices – raising that bar – will help make you the leader. So, if you want to know how you compare to your competition there is no need for an assumption, check them out firsthand. To obtain the best results from our marketing plans, we need to make sure our approach is well-thought and complete. This is especially true of trending marketing tactics, (i.e., social media and discount coupon sites). We feel pressure to use these because they are popular and we’re worried about missing out. But, how do you determine what tactics best suit your needs? An approach I have successfully used to test marketing strategy is to form a “complete marketing sentence.” Below I provide details and a ready-made template. Enjoy! Similar to the way English grammar requires you to pair a subject and verb for a complete thought, marketing grammar requires its parts of speech for a thought to be complete. The Strategy – what existing company strategy supports the idea, making it worth pursuing? Your Audience – with whom do you wish to connect. The Tactic – the activity you’re planning. Timing – when you plan to do the activity. Why this Audience Cares – the pain in their life you are solving. The Benefit of the Benefit – the effect this has on the quality of life of the audience. Once you have all the parts identified, plug them into the structure – to form the complete idea. Here, let me give you a “complete” sentence. thru [Direct Mail postcards] implemented [the first week of October 2012]. thus [allowing them to reaffirm their leadership role]. Here’s the background for that sentence. You offer company leaders a training program. It teaches them how to keep their employees happier and, therefore, reduces the number of employees that quit. You want to let these leaders know about this program through a direct mailing. Benefit of the Benefit: allows them to reaffirm their leadership role. While these results are important, what we really need is the how. The strategies, tactics, and action steps that will get us to the end results. Team members repeating “I need more sales” is not going to do the trick. Working this out doesn’t require rocket science, but applying these ideas may sky-rocket your business. “How can might we…?”How might we drive sales? How might we drive traffic? Determine at least four “how might we” answers. Then, for each of those answers ask again “How might we” identifying at least four responses for each. The best tool for this exercise is a simple outline. Indent for each round of answers. Remove lower-priced / smaller sized options from the menu. Add items for a different time of the day/daypart (e.g., add breakfast). Offer special in-store events to encourage non-traditional visits (e.g., art events, live music). Create/suggest additional uses for your product (e.g., baking soda for cleaning, cranberry sauce – not just for Thanksgiving). Offer add-on extended warranty/product insurance. Show customers products that pair with and enhance what they typically buy. Offer specials to encourage families and group sales. You should keep asking “how might we…?” as many times as you can. I’ll stop here. As you can see, with only two rounds, there are some great ideas in the works. We now have sixteen different options to help drive sales. Some will make a big difference, others not as significant. But, now we’re armed with strategies and tactics that will get us to our desired results. So, when you find yourself or your teams dwelling on that end result, try a few rounds of “How might we…” to get to the actions steps you need. Have you ever tried to put together a jigsaw puzzle with 500 or 1,000 pieces? It takes a while… And, needs to be done in more than one sitting. One of the reasons we miss achieving goals, New Year’s resolutions, and business strategies is that we try to accomplish too much at once. We approach the 1,000-piece goal as if it can be finished in one sitting. We get frustrated, the finish line seems a million miles away, and, we lose motivation. A better approach is to cut your goal into bite-sized chunks. Take the big idea and cut it into milestones. Cut milestones into projects. And further slice projects into tasks. I know… this idea isn’t rocket science… but sometimes in our excitement (and impatience) to get things done, we forget the basics. I wish you the best in meeting your goals, achieving your resolutions, and creating truly innovative things. I wish you the best putting that puzzle together.